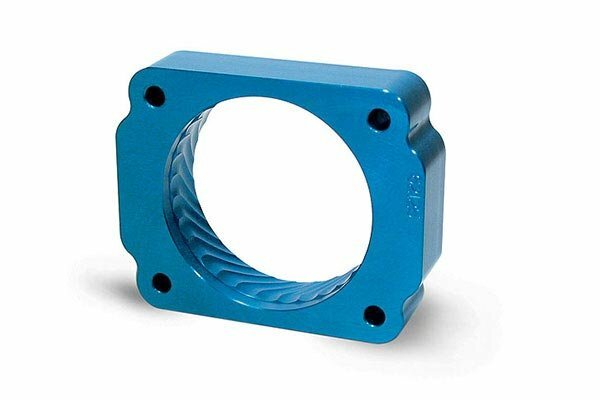 Jet 62100 - Jet Power-Flow TBI Spacer - FREE SHIPPING! Works as expected. A little more pep off the line and on the go. Not sure on the gas mileage increase if any. I don't have a way to really measure it bit I'm overall satisfied with it. Looks nice, easy to install, and made with quality. Installation was fairly simple although if you have DBW you may need to use a longer hose for the coolant line that runs underneath throttle body. Saw a good increase in mpg did see a good difference in pick up midrange and was a good addition with the k&n intake. Well worth the $85. It does whistle but i only heard it when the radio was down. Looks great and worth the purchase. I recommend this product for any car or truck. I've had great experiences installing all my after market parts in my silver ado. For someone who don't do mechanic to much everything a learning experience. I was so excited for this part to come in, I had started ripped the guts out to everything needing to come out before the ups could even arrive. I had a little difficulty putting the piece back together but over all it was worth it. The sweet whistle that you get every time you give it gas is sweet. And the response was a big difference. It seems like thats what my k&n intakes been missing. My next merchandise is the MAS (mass air flow sensor). I just ordered the jet performance module. I hope that's worth the money. Over, I recommended it to anyone wanting just a little more out of their toy. sounds really cool, in accomodation with a volant intake, i have noticed about a 1mpg improvement though! would definitely recomend to all interested in a easy performance bolt on product! Improves mid range torque and a few extra horses. Works well with my Volant CAI and JET Power Flow Mass Air Sensor. 2006 GMC Yukon SLE. NOTE: Yukon owners this will fit with an aftermarket intake system. Even after the installation you still have about 3" between the intake tube and OEM cooling fan. Noticed a difference on the throttle response as soon as I baccked out of the shop! Now if I can keep my foot out of it maybe I will be able to see if it helps with fuel consumption. Great buy, easy to install, cheep upgrade. Not a quick 10 minute install, but not too bad either. Low end improvement is noticeable. Whistling some have noted is not an issue for me. Not bad for the money. great improvement on accel and overall performance, highly recommend it! Great complement for a cold-air intake. The TBI spacer is a great complement for a cold-air intake. I put the intake on two weeks before the spacer. I noticed Improvements after doing each. The Horsepower and MPG have both gone up. The spacer was a tight fit on my 2005 Chevy Silverado with a 5.3L, but if you take your time it will go right on with our removing the coolant lines from the throttle body. Just be ready for the tell-tell whistle when accelerating using mid or higher throttle. Overall I would say that the spacer is worth the time and money. Recieved it in a reasonable amount of time. Instructions could have been a little better. But the power increase was considerable in first and second gear. Fuel mileage went up also. I was getting around 18.5 with a combination of in town/highway miles. If I baby it going 55 with the cruise set I can get 21. But if I get on it alot the mileage goes down to around 17. Which I can still live with. Even if you dont get better mileage the performance factor more than pays for itself at the first stop light. Worth the money and I would recommend it to anyone who wants better performance and possibly better mileage. noticeable difference in fuel mileage. can't give numbers. was installed along with volant cold air intake. but with both my mpg's went from 17.5 to 20 - 21 depending on highway traffic. these numbers are taken from normal driving over distances of 50 miles or more. of course results will vary with applications and driving habits. Installation on my Vortex 6.0 engine wasn't as easy as expected, having to disconnect various hoses including the coolant hose, thus having to drain some of the coolant. Disconnecting the intake with the original bolts is not the easiest task. Also, the fit is very tight after installation, leaving little room between the intake and the radiator. So far I have not been impressed by the performance. After having installed the Spacer, new spark plugs and a K&N performance filter, my average mpg went up from 13.4 to about 15.7, but has not settled at around 14.2. I would have expected a bit more with all the tune ups, but then again, we know that the 6.0 V8 is a gas guzzler. Make sure you know that this will fit your engine. I purchased this for my 01 GMC sierra with a 6.0L engine. I attempted installation, but it became obvious that once the spacer was installed, the trottle body and air intake would not fit back into their prospective places. This interfered with fan blade function and would not clear the fan shroud. I spoke with a TECH from Jet and he was very aware that many GM installations would not be possible with this spacer. Auto Anything should have been aware of this problem and advised of potential installation issues. It cost me part of my Saturday disassembling and reassembling for nothing. On top of all that, it cost me 9 bucks to ship it back. NOT HAPPY. luv the TBI spacer. i can really feel it on acceleration. It's a great addition to my K &amp;N CAI. But there is a whistling noise at various rpm's. This went on OK but needed to ask some questions and Jet Power was closed and since I had things off already I had to keep going. It has a whisle but not all the time and I just turn-up my Sirius. Too soon to tell if its saving me on my gas but I do feel a dif in 2 and 3rd gear. The instruction need to have more detail like the K&amp;N intake I put on. More throttle response. Smooth idle. Install was a little difficult due to incompatability with K&amp;N FIPK intake tube. 15 minutes with a die grinder and a perfect fit with no fan clearance problems. Reference # 767-608-856 © 2000-2019 AutoAnything, Inc.